This article is a study about Martians as they appear in H.G. Well’s The War of the Worlds, but also The Crystal Egg, and The Remarkable Case of Davidson’s Eyes – two novels by Wells that are less famous. Then it reviews various sorts of Martians that are derived from Wells’, from a robust variety of works. It is primarily presented as game stats because that’s how we worked back then, but it remains approachable by non-roleplayers since the bulk of the text is simple description and analysis. The Crystal Egg was added mostly on a whim. It would seem to fit Wells’s idea of “instruments… such as we have scarcely dreamed of,” and also helped flesh out Martian life. Finally, some of the history is interpolated from the known facts. There is no sure way to know the history of Martian evolution and the events leading up to the invasion, but this appears to fit all the facts, and most of the speculation provided to us by Wells. Real Name: Unrevealed, if names are even relevant. Marital Status: Likely none—Martians reproduce asexually and are emotionless. Group Affiliation: Martian military forces. Diameter: approx. 5’0” oval. Weight: Approx. 500lbs. An excerpt from the Spielberg version of War of the Worlds, showing the first contact with a tripod. Vampirism has a Range of Touch. Split takes approximately 17 APs of Time to complete, but is Permanent, with the “child” losing 2 APs (though this can and will be recovered through Character Advancement) and the “parent” losing none, and both parties retain the Split Power. This is the Martian reproductive process, which occurs through asexual budding. Gadgetry: 06, Scientist: 03, Vehicles (Martian): 04, Weaponry (Martian): 05. See also “Martian Technological Aptitude,” below. Iron Nerves, Resource Salvage, Life Support (Sleep), Scholar (Martian Technology). 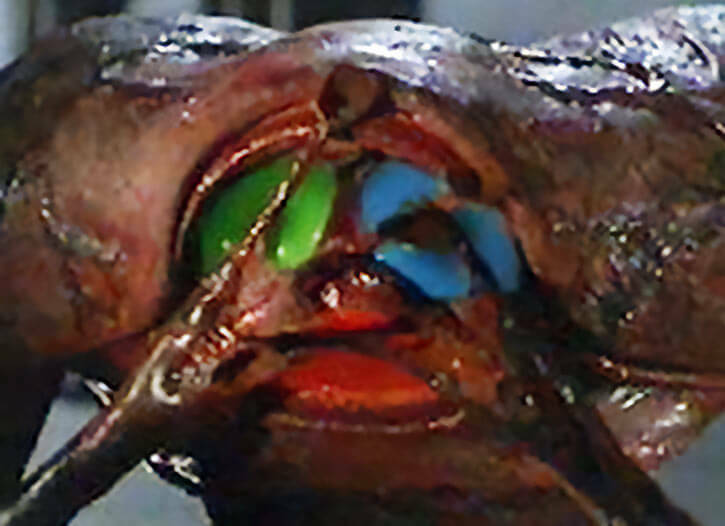 Strange Appearance, Minor Physical Restriction (cannot distinguish blue and violet colors from darkness), Minor Physical Restriction (hearing is limited in Earth’s heavier atmosphere), Serious Physical Restriction (weight greatly exceeds muscular capacity), Attack Vulnerability (-2CS to all microbe-based attacks), Attack Vulnerability (-1CS to all gas-based attacks, due to their massive lungs). While the Martians have 16 tentacles, they seem to blatantly use each set of 8 as we would a single hand. So, no Extra Limb Power in DC Heroes terms. Also, while the claim was made that the Martians were far more intelligent than we were, I certainly didn’t see any evidence of it, other than nifty technology, which is Scientist and Gadgetry. Likewise, Scholar (Martian Technology) is used in lieu of Genius, to represent the fact that the invaders are more technically advanced than humans, but cannot create anything outside of their current technological level. [BODY 06, Heat Vision: 07]. The Martian Heat-Ray is a heavy, camera-shaped box with a funnel-shaped barrel, just larger than a man, which is capable of projecting a white-hot beam of heat intense enough to incinerate a man in a single shot, and lay waste to somewhere in the neighborhood of a mile radius (the Range for Heat Vision may be 10 APs or more, due to this), once fully unleashed. Given an operational base, the Martians may direct a Heat-Ray skyward, and direct its energies with a parabolic mirror of some unknown black material, or it may be mounted on a mobile platform (see below). The beam of the Heat-Ray, not unlike that of a laser, is difficult to see. However, over time, the narrator seems to have learned what to look for. [BODY 06, Fog: 12, Poison Touch: 08, R#2; Fog and Poison Touch are only usable as a Poly-Attack, but get appropriate reductions to the Penalties]. Canisters of Black Smoke are hurled from a cylinder (which has the BODY Attribute) thought to use magnetic acceleration, as it produces no flash or smoke. On shattering, the canister releases a viscous, dark mist that clings to every surface, spreading and instantly killing every breathing thing in its range. It immediately, however, precipitates to a harmless powder on contact with water (and will eventually do so in a non-dessicated atmosphere over time, represented above by the Reliability Number). It is thought to contain an unearthly element, with 3 bright green lines showing when subject to spectrographic analysis, and possibly combine with argon (which is frequently found where oxygen is). Its exact effect, however, is unknown. It is therefore up to the GM whether Sealed Systems will work in any particular case. TRIPOD WALKER [/DEX/ 04 /STR/ 06 /BODY/ 08 /INT/ 01 /WILL/ 01, Extra Limb (six total): 06, Growth: 10, Running: 05, Skin Armor: 02, Super Breath: 01, Super Ventriloquism: 10 ; Growth is only cosmetic ; Super Breath comes from steam jets in the legs, making it ideal for taming Black Smoke ; Super Ventriloquism amplifies the hoots of the Martians for purposes of communication]. 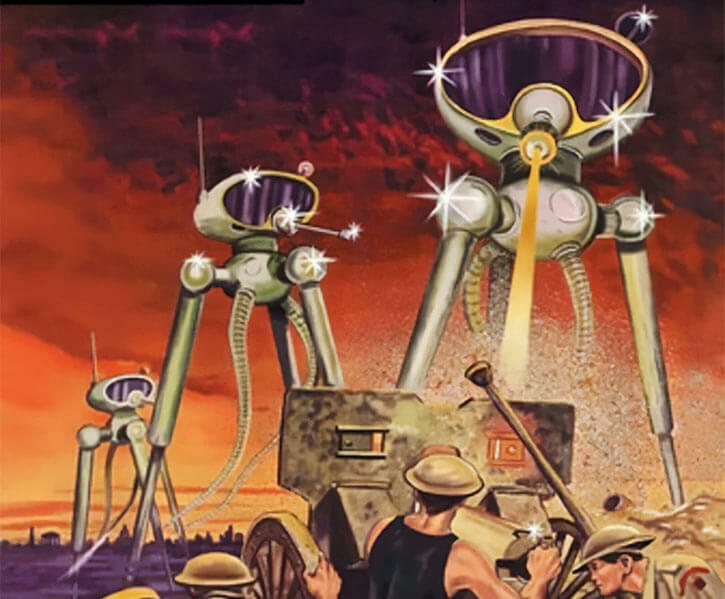 The Martian fighting machine is a 100-foot tall, mobile tripod with jointed legs, tentacular arms, and a rotatable, cowled “command perch” protected on top, all made from a surprisingly strong aluminum alloy. It is capable of ripping trees from the ground. It moves faster than any human can run in a strange, loping gait, each leg swinging in succession to produce something of a mincing, lumbering motion with a loud ring at every step. Little less than a direct hit with a bursting shell can penetrate its armored hide. Worse, the machine is capable of a certain amount of independent motion, so that it may continue its path of destruction for a short time, should the pilot become incapacitated. Note that the Tripod is usable even without Growth. In such a position, no other Powers are usable—the legs are collapsed inward, and there is no room for the tentacles—and is eminently usable as a strong shield when under attack (BODY and Skin Armor). HANDLING MACHINE [/DEX/ 06 /STR/ 04 /BODY/ 04 /INT/ 02, /WILL/ 01, Special: 08; Each handling machine has a single purpose, represented by it’s “Special” Power or Skill, which is consistent for each such Gadget]. The Martian “handling machines” are what we might term universal robots, and are used by the Martians almost as bodies to their brains. Each is a five-legged device with some, specialized to work toward a particular goal, such as excavating (Digging) or smelting and casting aluminum alloys (Flame Project), and many of these can be set to operate entirely autonomously. Note that the next generations of handling machines were to be equipped with the Martians’ prototype flight units. To integrate these, begin with 2 APs of Air Walking, moving to 5 APs, and then to actual Flight. However, these were never in evidence, only rumored and the remains of one such flyer located. The Handling-Machines, almost ironically, move so fluidly and with such self-direction, that they can easily be mistaken for living beings, especially when contrasted with the lethargic and clumsy movements of their masters. CAPSULE [BODY 18, Cold Immunity: 06, Flame Immunity: 12, Sealed Systems: 21, Hardened Defenses]. Cylinders 30 yards across at the base (presumably tapering to a bullet-like shape in front), constructed of an unknown metal, these served as the “vehicles” in which the Martians were almost literally catapulted to Earth. As such, they survived the blasts sending them into space, travel through space, atmospheric reentry, and final crash-landing, with their living cargoes—about 5 Martians and some Old Martians for food on the long trip—intact. It is conceivable that, within an atmosphere, the capsules can be piloted to a very small extent, but this was never proven. See “Martian Technology,” below, for details. If this is the case, then 1-2 APs of Gliding should be added to the Capsule’s Powers. Regardless, though, on landing, the back panel is essentially a bolt, and can be safely unscrewed from the inside to allow the passengers to exit once the metal has cooled. It may also be noteworthy that the capsule seems to have traveled with approximately 13-14 APs of Speed. The cannon which launched it, therefore had a STR Attribute (or Bomb, or whatever makes the most sense) of around 30 APs, certainly large enough to be visible to the naked eye from Earth. [BODY 04, Eye of the Cat: 38; Flash: 05, Eye of the Cat operates between pairs of eggs, but works in both directions—it is also Fatiguing to the user (Bashing Damage to MIND); Flash only emits a steady glow]. Hundreds of Crystal Eggs were sent from Mars to observe, and at least one arrived on Earth. It is conceivable that, under certain violent atmospheric conditions, an egg can be “linked” to a person’s vision, allowing him to see distant places without an egg at all (Remote Sensing: 22, Always On, always a particular distance and direction along the planet’s circumference from the subject’s location). The Eggs are approximately palm-sized, and after exposure to light, appear to be luminous (much like real-world glow-in-the-dark objects). Those sensitive to the egg will see a brighter light (Flash appears to be equal to the observer’s AURA, with a maximum of the AP score noted above). A narrower beam of light, however, activates the device. On Mars, there is at least one “field” of Crystal Eggs, each seated atop a tall spire, set out in a grid-like formation. The Martians vault up to them with the help of metallic wings, and view them for short periods, as part of their surveillance. It should be noted that the relevant engineering procedures described above would be totally unmanageable unless each engineer involved has a powerful eidetic memory. While the Recall Power is not listed above, since it seems like it would be “dedicated” to this task (and, thus, figured into the Scientist and Gadgetry scores), a completist might wish to add 25 or more APs of Recall to the Martians’ Powers. This would allow them to memorize the design of something about the same complexity as a jet fighter. If pursuing this course, it is also possible that at least a fraction of the Martians are constructing their devices by rote. For these cases, they would not have the Scientist Skill, and they would also have a special Limitation to the Gadgetry Skill, giving them a +2CS Penalty on OV/RV for all rolls to construct or repair non-Martian Gadgets, representing an inability to work with technologies outside their education. Also, reduce both INFL and AURA to 1 AP each (and Initiative to 6), representing a lack of creativity. Note, of course, that there still must be Martian scientists somewhere, to invent the technology and design these esoteric procedures, so these modifications would merely represent the highly-trained “grunts” assigned to the mission. The people of Mars clearly did not develop science and technology in the patterns familiar to the people of Earth. Like the Incans who created a superb system of roads, but no wheel, Martians appear to consistently use devices that any human would consider esoteric and convoluted, but technologically surpass anything previously seen on the planet. Specifically noteworthy is that Martian mechanical technology (not unlike that of the Incans) is oddly devoid of wheels. In its place is a pseudo-musculature which appears to consist of flexible, electrically-driven cylinders of a greenish fluid, which periodically fluoresces and evaporates or burns away. This greenish fluid appears to be an empowering component through all Martian technology, in fact. Even the Heat-Ray’s firing is preceded by several puffs of fluorescent green smoke and a deep, resonant hum. The fluid may also have been used, in some as-yet-unknown way, in steering the landing cylinders, contributing to their look of green shooting stars. The most consistent approach would be for the capsule, itself, to bend, slightly, with the semihydraulic fluid turning the entire device into a sort of tentacle, which could affect its aerodynamic profile as it moves. Physically, they are not very menacing – apart from the retractable bone pipette which serves as their feeding apparatus. However their tentacles appear to be entirely usable for most purposes, and their (theorized by the narrator) telepathic ability could, with practice, become something more dangerous to humanity. The Martians are also not quite designed for much physical work in Earth’s environment. On the other hand they appear to be astonishingly good engineers, able to construct complex devices like their walkers or handling machines—seemingly from scratch—in a single night. As one might imagine, with such a small contingent, this requires high qualifications, innovative techniques, and collective work. Also, being entirely emotionless, the Martians are obviously resistant to panic and other emotional manipulation, able to work continuously, regardless of conditions and outside events. Finally, while their science is little more advanced than that of Earth in the same era, the technology resulting from that science—mechanical engines of destruction, poison gases, and a powerful heat-projecting gun—are far more menacing than anything found on Earth at the time. Long—perhaps millions of years—ago, the lords of Mars were not unlike humanity. They were bipeds, standing approximately 6 feet tall, with round, erect heads containing brains much like our own, and had a physiology not unlike that of humans. The old Martians were of course adapted more for their world than ours, having relatively feeble musculature and almost spongelike, cartilaginous skeletons. 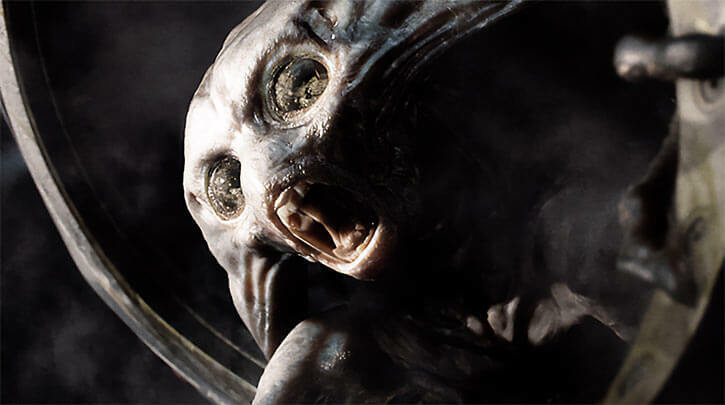 Their white, translucent faces, in addition, contained large, light-collecting eyes in flinty sockets, and two groupings of small tentacles beneath their mouths. As eons passed, though, some of the Martians underwent a regiment of forced evolution and genetic manipulation. Internal organs, brain components, and entire biological systems were sacrificed in favor of better developing the brain. The new Martians, in fact, became little more than brains with little more support than would be minimally necessary. The brains were draped in skull and skin to protect it, a heart to pump blood, lungs to oxygenate blood, and a bony needle to extract blood from others. The small clusters of tentacles expanded to replace both arms and legs. The immune system was discarded, and a campaign of pangenocide wiped out all microbial life. The brain’s emotional centers atrophied, and other centers bloomed. And so, the new Martians began to systematically prey on the old, herding them into encampments and even breeding them for efficiency as slaves and—because their physiologies used the same processed nutrients—food. To corral and administrate over their food source, the Martian overlords made helpers in their own images, foot-long, beetle-like brain-heavy creatures. These cherub-like beings soared above the pens of the old Martians (now reduced to the role of livestock) on collapsible metallic wings, iridescent in the Martian light. Over time, something went wrong with this arrangement. Perhaps the old Martians sought to escape and overthrow their masters, or perhaps their numbers dwindled to the point where the world’s lords lacked food. Mars, itself, may have had a major environmental change over time, causing the overevolved new Martians to be unable to maintain supremacy over their world, or causing them to thrive to the point of overpopulation. The narrator suspects that, Mars being smaller and further from the sun than Earth, global cooling and/or overpopulation by the Martian hominids caused a severe and irreversible shortage of basic resources. Whatever the reason, the new Martians found reason to leave, needing new pastures, a new world. Specifically, the Martians required their neighbor. For many years, the administrative Martian “cherubs” worked to devise a method of exploring the near planets, eventually devising the Crystal Egg. Dozens of these were launched into space over many years, in hopes of sprinkling the path of their Morning-Star (Earth) with enough that would fall as meteors. At least one appears to have survived, which fell into the hands of one Mr. Cave. Little information could be gleaned from Cave’s egg, though, as he regularly secreted it away or wrapped it in velvet so that he could use it to peer back to its source in private. Another experiment—possibly directly involving an egg—seems to have attempted to use the human eye in place of a Crystal Egg. Here, a Mr. Davidson was somehow altered and gained clairvoyance. Alas, such appears to have been unidirectional, sacrificed his native sight, and was only usable at a consistent range of several thousand miles, no more and no less. Thus, the project was abandoned, and Davidson’s sight slowly returned. For years, the Earth, unwitting, was so-watched with both organic and crystalline instruments for many years, as the Martians observed and planned, and finally built. Embedded in a dormant Martian volcano, a cannon was constructed, penetrating deep beneath the planet’s surface. Projectiles were loaded, compressed hydrogen gas was inserted into the lower portion of the tube, and the fledgling Martian space program, not entirely unlike that envisioned by Jules Verne for Earth’s, was underway. Near midnight on 1894 July 12, with Mars seen near opposition with Earth, for ten consecutive nights, the Martians launched a series of manned projectiles toward Earth, ready for invasion, from a hydrogen-powered cannon at several hundred thousand miles per hour. After the tenth, Mars fell silent. Again, the reason is unknown. 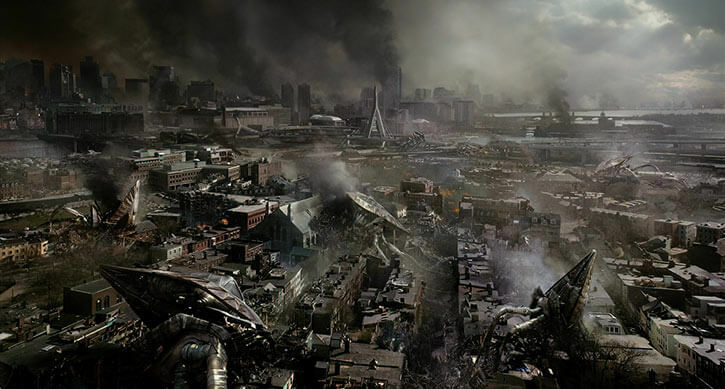 The cannon may have been damaged or damaged the environment; the few projectiles may have represented a full evacuation of the dwindling population, or even reasons entirely alien may have been involved. Two months later, against all odds, the first cylinder landed on the common between Horsell, Ottershaw, and Woking. Woking was very nearly destroyed when a delegation of humans—thinking the Martians to be vastly inferior and barely able to move themselves—approached their landing site; the Martians vaporized the men with their Heat-Ray, and then let loose on the approaching crowds and surrounding town. Then, at peace for a moment, they were able to get to work and prepare for the arrival of their fellows. Each night thereafter, near midnight, for a total of ten nights, a green flare shot across the sky and landed mere miles apart from each other. And, from there, invincible and without mercy, the Martians cut a path of chaos and destruction across England, from Woking, to Weybridge, and on through London to Mortlake and beyond. The military had little to no effect on the monstrosities, only superficially damaging one, and destroying another, before being routed, themselves. Those humans found by the Martians and seeming to be good meals (by comparison to the old race of Martians) were harvested, and the rest killed. Those who could escape evacuated the country, though some stragglers roamed what was left of the British countryside. Some of the refugees were, in fact, pursued, handing the Martians their only clear defeat. Wading into the waters around London, the sole warship in sight, the H.M.S. Thunder Child engaged the approaching tripod. Choosing to forego firing of ineffective weapons, the Thunder Child rammed and destroyed two of the Martian walkers. It was damaged, but moving for the third Martian when the narrator’s brother (our witness to the event) lost sight of the battle due to distance and spreading Black Smoke. While the final fate of the Thunder Child is unknown, it is known that this is the only clear victory humanity would see for quite some time. And then, perhaps three weeks into the Martians’ campaign, it ended. Where humanity could not defend its sphere, the trillions of mindless bacteria and virii managed to take hold. Having at home no use for, and so lacking an immune system, the Martians proved quite susceptible to infections of every sort, beginning with the putrefying agents. Literally overnight, the invaders transformed from indestructible monsters to mobile piles of rotting meat and finally to alien corpses. Through no fault of their own, humanity was saved. Moreover, the attack from without brought humanity close together. While many sources describe the Martian transit to Earth as six years, this is a misinterpretation of the narrator’s opening comments (“The storm burst upon us six years ago now”). Even at a “mere” ten thousand miles per minute (which is six hundred thousand miles per hour) gives the Martians a travel time of around two months. Therefore, it is fairly clear that “six years ago” refers to the entirety of the Martian invasion. This is consistent with the epilogue, where scientific advances gleaned from the Martian artifacts are briefly described. It is granted that this interpretation is blatantly inconsistent with the publication date (as that would be only three or four years—perhaps the story was not initially meant for release so soon), but a publication date for a science-fiction story hardly seems a useful discriminator when more concrete (with respect to the story) dates are actually contained within the text. July, similarly, seems to be the date of launch, as the opposition was mentioned in an early August report, and it was still summer when the Martians landed (seeming unseasonably warm, in fact, mid-September seems fair). A quick glance at some astronomical charts shows that, conveniently, in two months, the Earth would be exactly where Mars had been in its orbit, making it the shortest possible trip during the opposition. The narrator tells us that, “Those who have never seen a living Martian can scarcely imagine the strange horror of its appearance.” His own first glimpse of the aliens filled him with paralyzing dread and disgust, which would appear to corroborate that statement. The Martians’ bodies are billowy-looking affairs, generally round and about the size of a bear. Their skin tends toward an oily, greyish-brown leather, reminiscent of fungus growth. At the front of the body, there appears a rounded head (the entire back of which appears to be a large tympanic membrane), though with neither brow nor chin ridges, or any structure obviously corresponding to a neck, that term might be overly specific. The eyes are intense, not only in their glare, but in their physical appearance, which seems to gather and reflect light, much as the eye of a cat does. Beneath the eyes, quivers a v-shaped mouth, with a pointed upper flap (for the word “lip” seems inappropriate) tucking into a wedge-shaped opening, dripping considerable volumes of saliva as it moves. To the each side of the mouth are the aforementioned manipulative appendages, with sixteen tentacles divided into two symmetric bundles. It is assumed (though never shown) that the Martian ingestive apparatus—a retractable bone tube—can be found either within or beneath the mouth. On the topic of movement, it seems that this may be their most alien trait, judging from the narrator’s account. In the oxygen-rich but higher-gravity environment of Earth, the creatures’ breathing is a laborious tumult, causing them to continuously pulsate, heave, and convulse. Every clumsy, deliberate movement masks none of the obvious pain caused by moving in the heavier gravity, and causes movement to appear slow and tedious. Even their far-lighter appendages can frequently do little more than sway or hang. 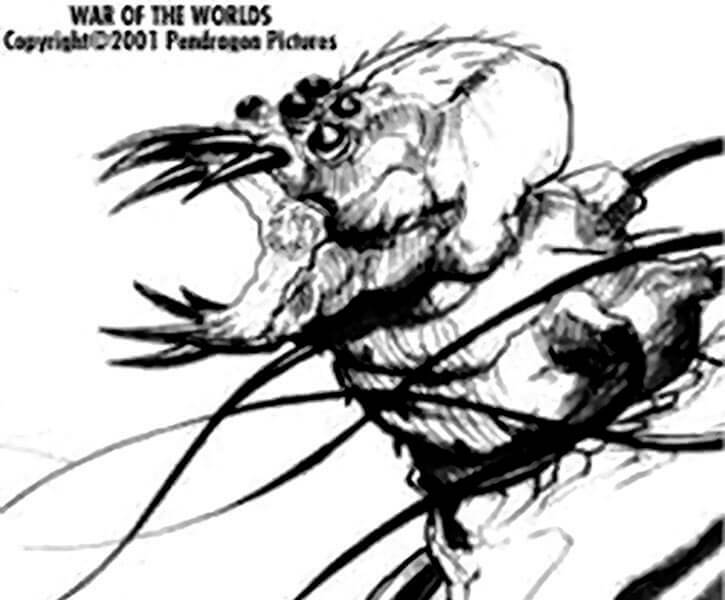 Those encountered in The War of the Worlds have all the personality of any movie monster. Crush, kill, destroy, though they also tend toward humiliation and defeat of opposition, for no really obvious reason. They are passionless, cold, and calculating, their equivalent to our limbic systems being one of the many features they have discarded in evolution. Apparently needing no sleep, they also work continuously, never resting for more than a moment, and even then, seeming to rest with a specific purpose. Their apparent true motives are to feed on human blood, and would almost certainly have been planning “ranches” of the most productive humans they acquired. Not two years after the invasion of Earth, flashes were seen once again on the surface of Mars, presumably heralding another invasion. The governments of the world, on the brink of despair, charged scientist Thomas Alva Edison with forming resistive technologies. Edison surpassed everyone’s wildest expectations, and Earth decided to bring the war to Mars. The Martians found in this venture, however, were passionately evil, giant hominids, who were ultimately destroyed by flooding their planet. 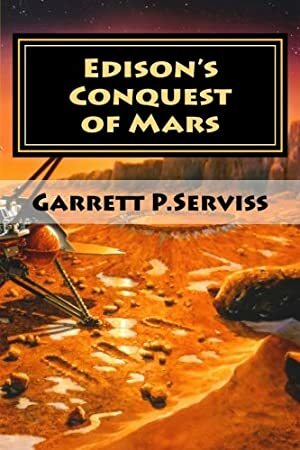 Given the massive inconsistencies with the original, Edison’s Conquest of Mars is being more or less discarded for the purposes of this writeup. Granted, it is theoretically possible that the Martians in Serviss’s story are merely stronger members of the “old” Martian(hominid) race, but even this seems unlikely. 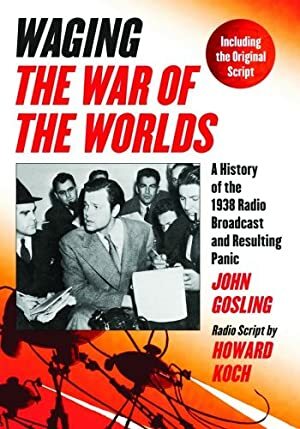 In 1938, Howard Koch adapted “The War of the Worlds” as a radio drama, which was aired by affiliates of WCBS’s Mercury Theater on the Air on Halloween of that year (and set exactly one year in the future), starring and directed by Orson Welles. Those Martians were nearly identical, but with some key differences. In particular, their cylinders traveled much faster, covering the whole forty million miles in what appears to have been about one hour (about 35 APs of speed, which probably would’ve destroyed the Earth, just from the shockwave of the crashes, not to mention Mars), and sent many more cylinders across the entire planet, apparently anywhere between one and three to every major city. Once on Earth, they manifested the Walkers (which were three times the size of those in the original story) almost immediately, and seem to have succumbed to disease in only a few days. The portion of the forces nearest New York began near Princeton, moving northward to meet a second trio of Walkers, one of which was destroyed (the only one hit, in fact). The remaining five knocked over skyscrapers in Newark (they might, thus, require a STR Attribute of closer to 8 APs), then walked onto Manhattan, where after frightening away or killing the populace with Black Smoke, they fell ill and died. Except for the repeat of their sudden death, it is conceivable that this more extensive invasion was a literal second attempt at destroying humanity. In 1953, the Martians attacked once more. This time through, gone were the tripods ; they brought cobra-like spaceships with defensive shielding, and used it to run roughshod over Earth’s populace. Only when stepping outside of their vehicles to inspect their new prize, did they discover their folly, quickly succumbing to Earth-bound germs. Almost overnight (again), they died, crashing their ships wherever they were hanging or flying. Again, the differences are significant, but this could easily be cast as a third invasion force, with technology improving, but the cause of death of their predecessors still unknown. 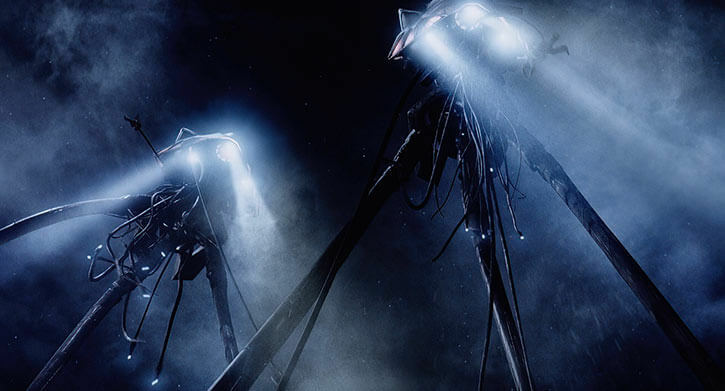 Their flyers, for example, are similar in nature (if not in locomotion) to the tripods (replace Running with Flight, and add Sealed Systems: 25). 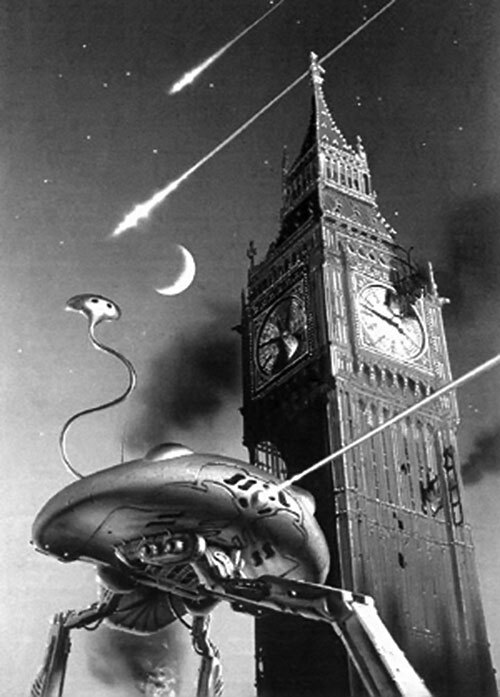 In 1988 (“War of the Worlds: The Second Invasion” television series), it was revealed that the Martians appearing in 1953 (see above) had not died, but instead went into a hibernative state and their bodies claimed by the United States government. When Fort Jericho, the base in which they were stored, is accidentally irradiated, the germs the aliens carry are killed, and the creatures not only regain consciousness, but develop the ability to temporarily (due to radiation poisoning killing the host) take control of human bodies. 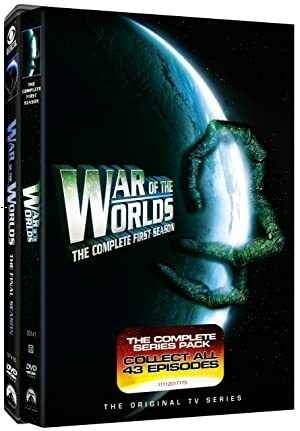 Starting with the terrorists who caused their awakening, the Martians use their human hosts to launch a genocidal war against an unsuspecting Earth. Dr. Harrison Blackwood teams up with microbiologist Suzanne McCullough, computer programmer Norton Drake, and army Lt. Colonel Paul Ironhorse to save the world from this alien menace, starting with preventing the Martians from reclaiming their thirty-year-old war-machines. After this significant setback, the Martians move to recruitment. First, they look into reviving Martians captured in a failed attack on Canadian soil, then move to recruiting humans that they can inhabit. A brief foray into Grover’s Mill is made to attempt recovery of the ship used in the 1938 invasion (see above, the Mercury Theater version), and at least temporarily recover a Heat Ray. After failing to claim files that would lead them to thousands of their buried and hidden brethren, they launch an all-out war on a mostly-unsuspecting humanity. They focus primarily on bioterrorism (viral releases and poisons), though nothing is ever ruled out. Subliminal messages, nuclear bombs, and infiltration are all used, and defense is also built, as the aliens learn about immune systems and try to strengthen their positions, biologically and tactically. In the second season, deadlier aliens from Morthrai arrive on Earth and execute their predecessors. Meanwhile, Blackwood and McCullough lose Ironhorse and Drake, but are joined by mercenary John Kincaid, who helps them fight in a post-apocalyptic urban wasteland against a second wave of invaders dedicated to the death of all life on Earth. Here, the fight becomes progressively more intense (with the cloning capabilities and psychic powers of the new invaders steadily coming to light), though an increasing number of good-natured aliens appear and help in Earth’s fight. The Morthren are turned back when it is learned that their leader, Malzor, destroyed Morthrai and came to Earth in a complex scheme of revenge. When this information is passed to the Morthren, Malzor is killed and the aliens surrender. These Martians seem to bear little resemblance to those described by Wells (and, in fact, Mars is not referred to during the series). However, they are arguably “close enough,” and are certainly intended to be the 1938 and 1953 invaders. 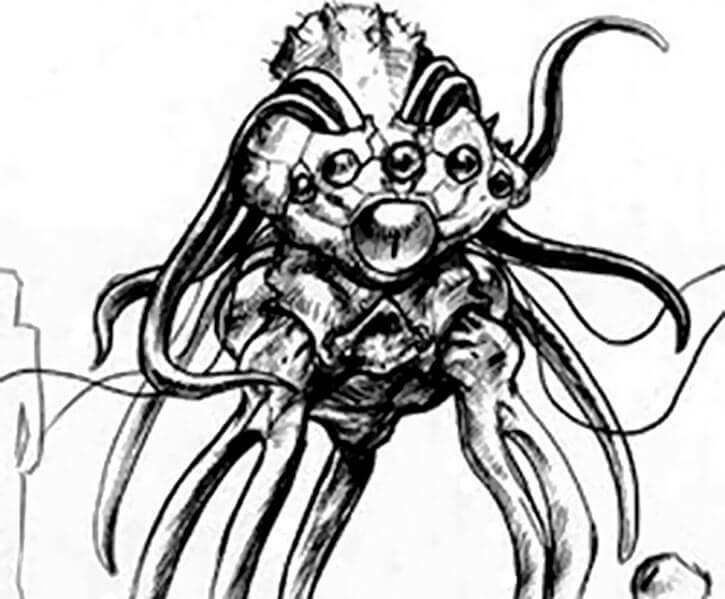 These smaller aliens should be given Personality Transfer (Bonus: Does not leave body behind; Limitations: Requires physical contact; only works in the presence of at least 1 AP of radiation, modeled as Cell Rot with an Area Effect) and possibly a few APs of Shrinking (Always On). They are lead by a triumvirate known as the Advocacy. The humanoid Morthren, of course, are not even conceptually based on the Martians, and do not use Martian technology, and so will not be treated here. In modern times or later, NASA launched a manned mission to Mars, the Bermuda. Not long after losing contact with two of the scout vehicles, this mission’s commander noted a green mist rising from a nearby valley shortly before their transmission was cut short. 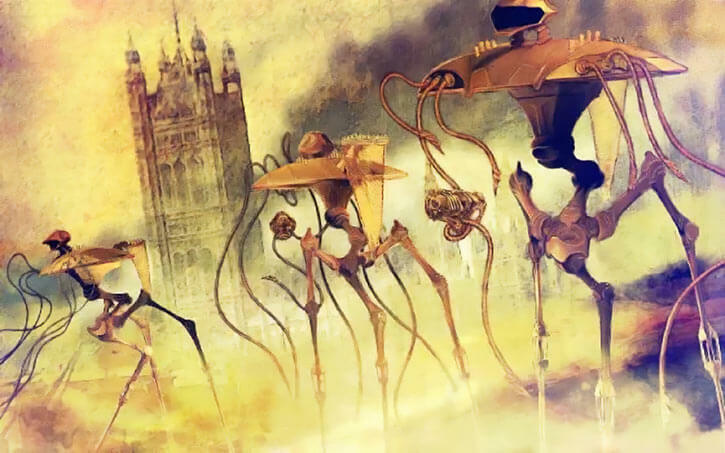 While not (necessarily) from Mars, John Christopher (among the pseudonyms used by Samuel Youd) wrote the Tripod Trilogy, The White Mountains, The City of Gold and Lead, and The Pool of Fire, eventually adding the prequel, When the Tripods Came. Youd never intended these to be the Martians of Wells, but realized after the first installment’s publication how precariously close the two were. The Tripods arrived in the present day. 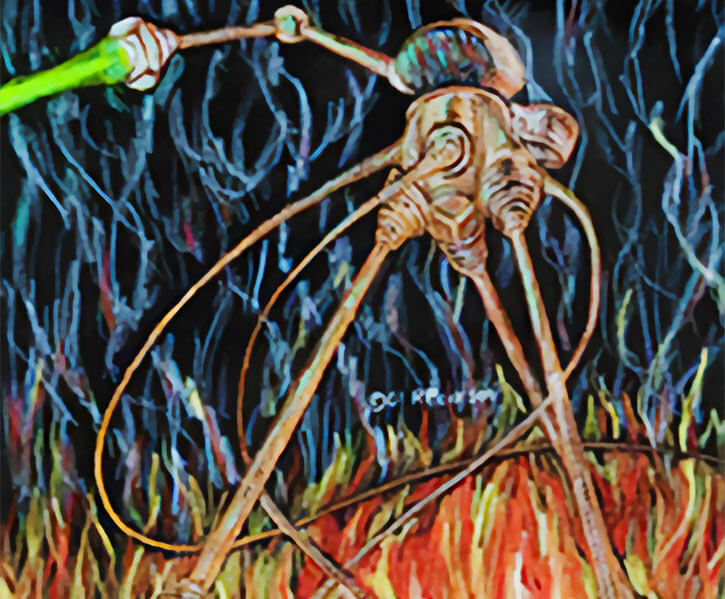 Unlike the Martians (or, perhaps, learning from the mistakes of their predecessors), the pilots of the Tripods apparently have a working immune system (possibly through some sort of shapeshifting), a visual acuity more like a human’s (as they require searchlights to see in the dark), and have something of an emotional being. The Tripods they pilot, though, are clear dead ringers for the Martian devices. 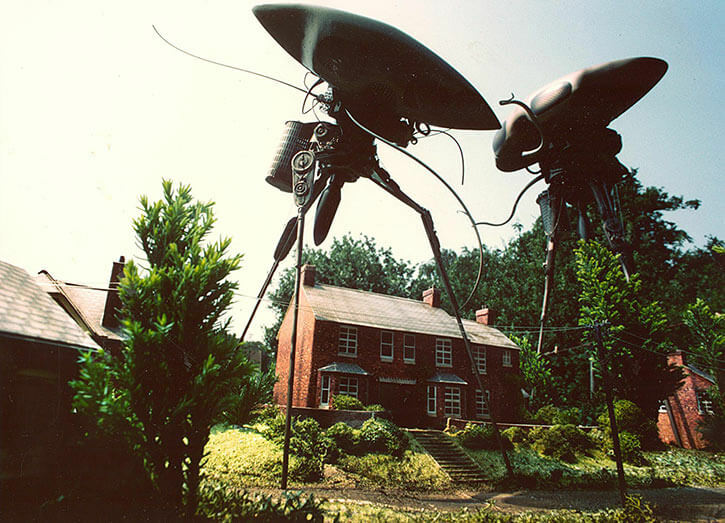 When the BBC adapted and expanded the Tripods trilogy for a television miniseries, it was further influenced by Wells, adding a Heat-Ray, the hooting calls of the aliens, and so on. These Martians have their own writeups.org profile. 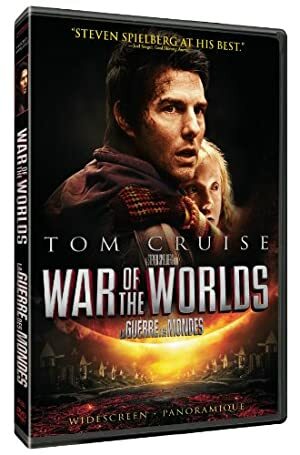 In 2001, Pendragon Pictures announced yet another remake of The War of the Worlds, this time set in modern Seattle, but staying as close to Wells’s material as possible, though it was supposed to include ten-story-tall tripods. 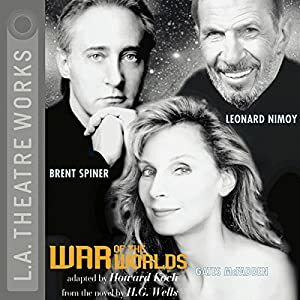 With the attack on and destruction of the World Trade Center later that year, production was pushed back, and Pendragon’s production is being retooled to precisely retell Wells’s story, rather than update it. Pendragon says on their website, “this new version will be an accurate adaptation of the Wells classic story placed in its original 1898 setting.” The new target date is 2005. Sigh. 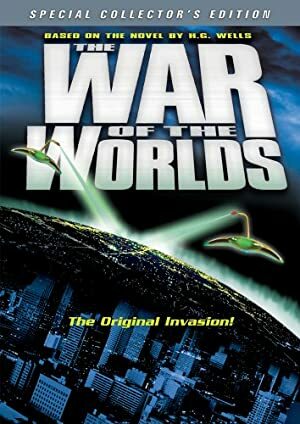 Paramount Pictures has recently won a court case brought by the Wells family in an effort to take back rights to film versions of The War of the Worlds, sold to them in 1951 (by Frank Wells). They have announced work in conjunction with Tom Cruise’s C/W Productions and possibly director Steven Spielberg, though no details have been released. Clearly, these aren’t the DCU’s Martians, neither white nor green. However, they could be a race that arose after J’Onn’s race died off, or they could just as well be from a different planet. On the other hand, there was a stretch of DC continuity when the DCU Martians weren’t from Mars at all, so there still might be some wiggle room, there. Regardless, they could easily have harassed England at the end of the XIXth century, and perhaps just over a hundred years later, they’d like a rematch. Let’s hope they’ve improved their walkers, though, since the model seen here could easily be taken out by a modern low-end tank, let alone a Justice Leaguer. An alternate possibility is that, whether or not these were Martians were from Mars, they might have made planetfall in Scotland. The invasion, of course, was shorter-lived and less widespread than what Wells documented, and the British government was able to cover up the crisis, more or less. Decades later—in 1940, to be precise—the Nazis intended to infiltrate the compound where the Martian technology had been hidden and, from there, begin a full invasion of Britain using alien technology. It is this plot which Alan “Green Lantern” Scott, Jay “Flash” Garrick, and Bruce “Batman” Wayne (or his Post-Crisis replacement) were sent to disrupt, which in turn lead to the formation of the Justice Society of America. If desired, this allows for replacing the Valkyries with elite troops wielding Martian weapons. Gudra (who later joined Axis Amerika) would have been a German special agent wielding a small Heat-Ray and a flying Handling-Machine. Doing this probably loses the “JSA fights Ragnorock” story, but since that wasn’t a very good idea to begin with, and subsequent retcons have only made it worse, that might not be the worst change ever made. In a more ironic move, the no-wheel technology of the Martians could have been used by the Nazis to build the War Wheel. Commander Steel and especially Robotman (whose brain could be said to “pilot” a mechanical body) might also have their origins rooted in salvaged Martian technology. It is, perhaps, also noteworthy that DC had an Elseworlds adaptation by Roy Thomas of The War of the Worlds, where the 1938 Martian invasion (from the radio play) caused Clark Kent to reveal himself as Superman. There are some annoying contrivances (dragging in Luthor, for example, which reads like it stemmed from editorial edict), but overall, it’s a good read. For the purposes of that story, this writeup—particularly the Heat-Ray—may need some minor enhancement, depending on the tactics used by the Martians (most importantly, frequency of Team Attacks), and also the GM’s idea of the Golden Age Superman’s BODY Attribute. The numbers above will work very well if Kent has a BODY of 7-8 APs, but will need revision for other ranges. Also in DC’s non-continuity appearances is the Justice League’s animated series. While clearly not the Martians which Wells wrote about, the alien creatures shown in “Secret Origins,” the pilot, indeed used vehicles not unlike the Martian tripods. A Character with the Resource Salvage Advantage makes no purchases, instead fully capable of “living off the land,” locating whatever he needs in the trash or in obscure corners nobody else would consider. In terms of mechanics, the Character has no Wealth/Resources Rating of his own. However, when a Wealth Roll is required, the Character may use, as AV/OV, half the APs of Wealth of the wealthiest character in the region (the “region” is defined by the GM, and should depend on the situation). RAPs, of course, act as normal. A character with Life Support (Sleep) gains no Penalties from lack of sleep or rest, even in such Genres where it such is common. By John Colagioia and Ethan Roe. 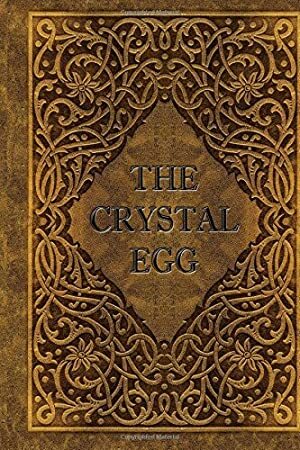 Source of Character: The War of the Worlds, The Crystal Egg, and The Remarkable Case of Davidson’s Eyes by H.G. 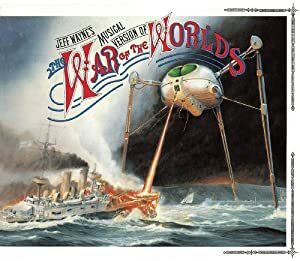 Wells; Jeff Wayne’s Musical Version of the War of the Words (I swear I’m not making it up—check it out on Amazon or something) was also used, but it’s not much more than an abridged version of Wells with disco-ish background music. Helper(s): Sébastien Andrivet, Morgan Champion, Roy Cowan, Phil Dixon, Eric Eick, David Johnston, William Peterson.